Over a very long period of time (in fact about 60 years), the galvanizing of steel reinforcement has been shown to provide a cost-effective and reliable means of corrosion protection to concrete in a variety of exposure conditions. Clearly, galvanizing is only one of a number of protection systems that can be used in reinforced concrete. However, the convenience of manufacture and supply of the product, the ease of handling, transportation and installation, and the fact that no special design requirements are needed, has meant that it has been accepted in many countries for a wide range of concrete construction. The last 15-20 years in particular has seen extensive research and field investigations undertaken of the characteristics and behaviour of galvanized reinforcement. This considerable body of work has repeatedly highlighted the benefits of galvanizing in delaying the onset of corrosion in reinforced concrete and in reducing the risks of cracking and rust staining of the concrete mass. The higher chloride threshold for zinc compared to steel, and that zinc in concrete is virtually unaffected by carbonation, provides galvanized reinforcement with an inherent corrosion resistance well beyond that of conventional steel bar. The very presence of the coating itself further extends the service life of galvanized bar because of the time delay during which dissolution of the coating occurs. As with all corrosion protection systems, there is a cost associated with galvanizing. 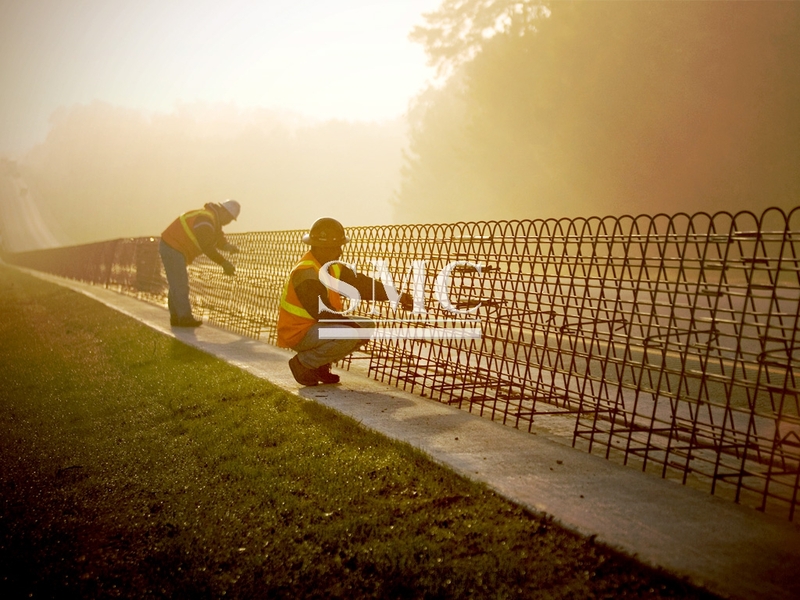 Though the cost of the reinforcement may increase by about 50% when galvanized, when considered against total building and construction costs, and the enormous potential costs associated with untimely repair of damaged concrete, the premium that is paid to galvanize reinforcement is very small indeed. Even if one cycle of local patch repairs over a large concrete structure can be avoided, the cost of the galvanizing would have been more than met. Primarily though, the reason for using any corrosion protection system is to extend the service life of the structure. Experience with galvanizing has shown this can be readily achieved in many types of reinforced concrete structures and elements in mild, moderate and severe exposure conditions. Above all however, it is important to remember that when using galvanized reinforcement (as with any protection system for concrete), that the concrete is properly designed and placed and is appropriate for the type of element and the exposure conditions. Unless specific design requirements apply, such as reduced cover or ultralight-weight construction, the concrete should be designed and placed as though conventional steel reinforcement was to be used. In essence, the use of galvanizing should not be at the expense of this basic quality and integrity of the concrete. In this way, the galvanizing can be considered to provide protection against those circumstances that may lead to premature corrosion of conventional reinforcement and deterioration of the concrete mass. Corrosion of galvanized steel in concrete is less intense and less extensive for a substantial period of time than that of black steel, galvanized steel in concrete tolerates higher chloride concentration than black steel before corrosion starts.Moreover, galvanized reinforcement delays the onset of cracking, and spalling of concrete is less likely to occur or is delayed. The concrete can be used in more aggressive environments. Thus a standard design of concrete components can be retained for various exposure conditions by the use of galvanized steel in the most aggressive cases. Poor workmanship resulting in variable concrete quality (poor compaction, high water/cement ratio), can easily be tolerated. Accidentally reduced cover is less dangerous than with black steel. Please note that even if these benefits are achieved, the use of galvanized reinforcement should not be considered as an alternative to the provisions of adequate cover of dense, impermeable concrete, unless special design criteria have to be met. Galvanizing of reinforcement is a complementary measure of corrosion protection - a kind of insurance against the inability of the concrete to isolate and protect the steel.